Even in 1984, the majority of passenger trains from Harbin to the south were diesel hauled with steam restricted to a few stoppers. Sifang built class DFH3 diesel-hydraulics handled all the expresses and fast passengers. Mechanically, these 2700HP machines appeared to be based on the DB class 221 hydraulics although the bodystyle was clearly different. 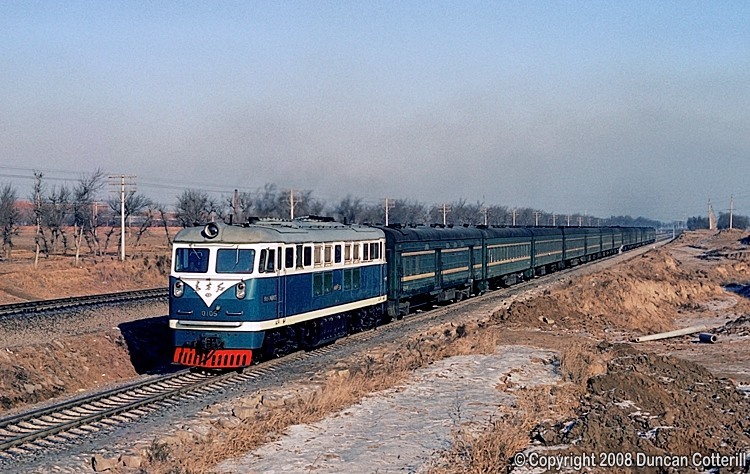 DFH3 0105 led a southbound train up the bank from Harbin to the summit at Wanggang on 27 December 1984. After spending less than two hours here we had to get back on our bus and return to Harbin for lunch. As we drove away an RM pacific stormed up the bank on a stopping passenger. How many lunches would that photo have been worth?